In this short series from "Through the View" by Bill Long, the fairly minimalist exteriors we see as outside observers are complemented by the very detailed world of the series' characters. If you're as visually oriented a person as I am, you are likely to get a real kick out of the clever and colorful world of Bill Long's "Through the View." This exhibit of 32 oil paintings, showing in the Activity Gallery at the Brattleboro Museum & Art Center through February 21, explores "the idea of careful observation," writes Susan Calabria, curator -- "with regard not only to what we as viewers see, but also to what the characters that 'people' the pictures are looking at." We begin, for example, with the closeup of a birdhouse in a tree, its red-feathered occupant peering out at us. 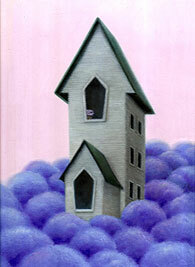 This "view" of ours is paired with a scene set inside the birdhouse, where we can see what the bird is looking at through the opening: a barn across the meadow. 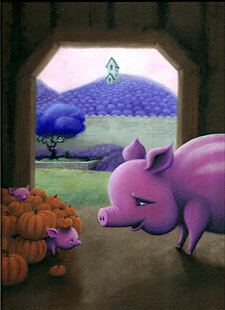 The next painting is a closeup of that barn, in whose doorway we can see part of a pig and a pile of pumpkins. 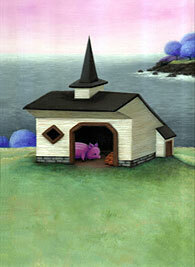 The next in this series of views is set inside the barn, looking out. We see not only the birdhouse tree in the middle distance but a house on a further hill. 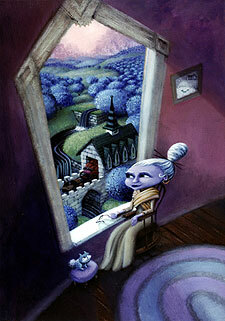 Then Long plants us right outside that house, where we linger and notice someone in the upstairs window. No surprise, in the companion view, weíre up in the room looking out that very window, too, to the next point in an irresistible journey. Long's whimsy appeals to all ages, and his design sense and color choices are reminiscent of the animated worlds we've all grown up with. His interests "encompass Vermont landscapes and seasons, animation, music, and garden and architectural design," writes Calabria, "and it is easy to see these influences in his art." Be sure to catch this show, which is the perfect antidote for a dreary winter's day. The BMAC is open 11 to 5 daily, except Tuesday and Wednesday, and on Gallery Walk Fridays until 8:30.